On November 16th, hostilities between the Ohio Warriors and the Russians ceased, and we fell short of victory by 7 stars. This was a difficult loss to take, as the 2 clans were very similar, almost “twins”. Both clans had the same number of clan victories, and other than the top tier, the two clans were very similar on townhalls. There are a couple of areas we need to improve on, and there were some things we did very well. The following is a breakdown of what we saw, and I will follow it with some recommendations to the clan. Top Tier: The Russians had us outgunned at the top, and I want to commend our top tier for doing their best, and really giving their top tier a good run for the money. Especially Josh, who used his second attack knowing that we probably would not win. That is the stuff leaders are made of. Thank you top tier for all you do, and for taking care of our war map clan castles, as well as funding our war attacks in so many instances. We have truly been spoiled by your generosity. 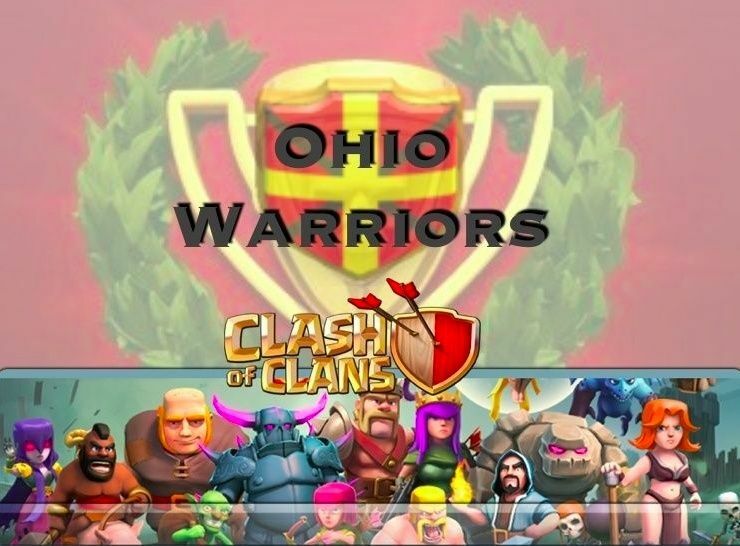 Discipline: Ohio Warriors is a VERY disciplined clan, without a doubt. Unfortunately, we had just a few undisciplined attacks, whether it was attacking too high or too low. I cannot stress enough how important it is to pick your target wisely. Don’t bite off more than you handle. On the other side, we cannot allow attacks too far below you own level or town hall. If you are having difficulty selecting a target you are confident with, just let a co-leader or a veteran elder know and we will help you. It may be that you will have to wait a bit to see how things shake out before using your second attack. And that’s ok. We can’t rush into battle unprepared because it can cost stars. Communication is the key. You will not be chastised ever for communicating. The Russians had a system where they used their first attack on their corresponding number. I believe they did this in every instance if I’m not mistaken. I’m not sure we want to go this route, and I will discuss with the council. One of the reasons I’m not sure about this is because I really don’t think it’s why they won. They had plenty of failed first attacks. We’ll let you know, and feel free to chime in on this subject in the response box below this. Execution: We had some fantastic executions, and we had some not so great ones…like mine. As we continue to upgrade our bases, we can expect tougher and more disciplined opponents. This is just a fact of the game. And really the only way to handle it is like Tuba says: “practice, practice, practice.” Especially at the top of Town Hall 8, we will have to really work on our ground games, or a mix of ground and air. We are very pleased with the usage on the forum so far, and this new project of sharing ideas can take us to the next level. Imagine getting some attack concepts from the likes of Jared, Skyhawk, or Josh…just to name a few. Let’s give this new idea a try, I think we may really like it. Townhall 7’s: Excellent job this weekend as usual. You continue to use your dragons and rage effectively, and your contributions to the war effort have been outstanding. I encourage you to continue 3-starring other TH7’s with your dragons and rage. You aren’t required to use dragons as you know, but we strongly encourage it because of the effectiveness against TH7 bases. Participation: Excellent job on participation again. Remember, we go to war the same time every week. It is YOUR responsibility to have enough elixir to fund your attacks, and also to get both attacks in. If you are going to be out of town without internet, then we understand. However, if you’re just plain busy, that’s no excuse. We are all busy. Newbies will get no warnings. Other members will get one warning. Under no circumstances will blaming one particular person or group of people (ie, “top tier”) for a war loss be tolerated. If it’s “your opinion” that somebody cost us the war, then you need to keep it to yourself. If somebody performed poorly (as I did), I can ASSURE you they already know this, and DO NOT NEED REMINDED. This is just common decency. Try putting yourself in those shoes and see how you would like it. Now, let’s get to work on our attack strategies, and keep an eye on our war base layouts. It’s likely not going to get any easier from here on out. As always, any feedback is welcome. Keep it civil please.